Reviewed by Lynn Hartell. Viewed at Santa Barbara City College, Santa Barbara. The Driver is Red is an animated short by first-time filmmaker Randall Christopher. The film describes the events around the discovery and capture of Nazi war criminal Adolf Eichmann, who sent millions of Jews to their death during the Holocaust. The setting is Argentina in 1960 and the story is narrated in first-person. We meet Zvi Aharoni (Mark Pinter, voice), an Isreali spy on a mission to track down the infamous war criminal who was living under the assumed name Ricardo Klement. A blind man helps Aharoni finds Klement’s home but he hits an apparent dead end when he discovered he’s moved without a forwarding address. He continues to research and follow his hunches. In a fantastic turn of events the two men end up on the same bus and Aharoni finds Klement’s home, a simple hut outside Buenos Aires. The code phrase “the driver is red” confirms that he has found his man. The film then describes the details of the mission to capture Eichmann and bring him to justice in Isreal. Fearing that Argentina would block Eichmann’s extradition, complex measures were taken to keep the mission secret. Team members, each with fake documents, were flown in from different countries, several safe houses were rented and vehicles and identities were disguised. Christopher’s handling of the actual capture and escape is exciting and compelling. The film is animated in a series of black and white sketch drawings illustrated by Christopher, who is a comic artist by background. The fast-paced nature of the drawings, in combination with dramatic music keep the story moving quickly. Historical aspects of the Holocaust and Eichamann’s role in it are described with photos and add to the significance and importance of tracking him down. Although this film is based on historical facts it is told as a story rather than a documentary. This blending of documentary and story-telling adds to the strength of the film. Following the film the writer-director spoke of his passion for the events, which he had discovered in an article in the New York Times. He described his attention to detail and his need to tell the story as almost an obsession. The lessons learned from the Holocaust are more important than ever, especially in the current political environment of alt-right, anti-immigration and concerns of war. History repeats itself. Randall Christopher’s obsession and his riveting film remind us to never forget. This is a really accurate way of explaining this film. He does a beautiful job of informing without losing the storytelling aspect of the film. I liked his style of animation, I thought it felt really personal and helped the storytelling. I’d be happy to see more Mr. Christopher work in the future. A great way to talk about this movie. It is told more like a story and i think that is what makes it so great. A historical truth presented as fiction. it was a really well made film. You can really see that Christopher put down the time in each image that we see on the screen. I really think the animation was brilliantly simple which allowed us to really focus on the importance of this topic. I agree it also aided in keeping the story moving and the audience engaged. Great film and review. I think you are right, the film focus on the detail in the entire story. When people start to track the person that he wants to track he has to be the focus of every detail that could help him to find the target. 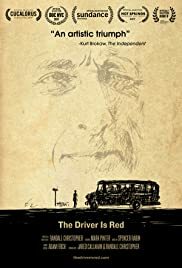 I think the name of the film is meaningful, the name “ the driver is red” is not only code but also evidence. The film is short and in the form of animation, but the film did a great job to tell the story very clear, some small detail makes the film very delicate. The scene of catch, I think is very exciting, just like you said, the filmmaker makes me very excited, all the pictures are beautiful, and people can enjoy in those. I think this is a great movie that people can enjoy in both of the story and the pictures.